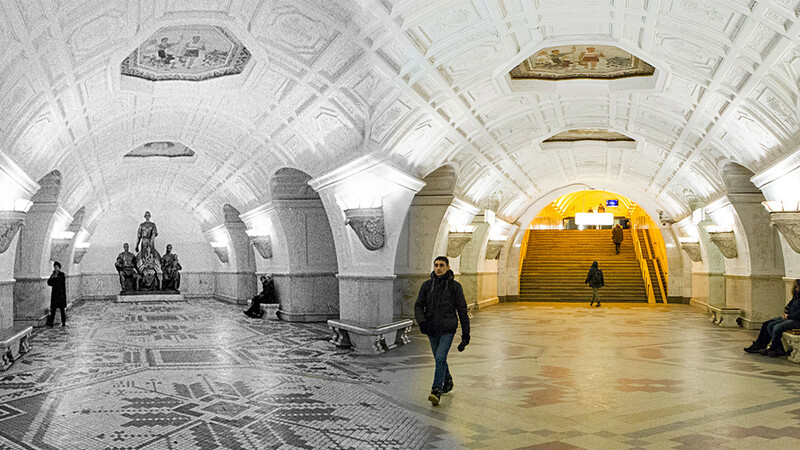 Trace the evolution of Russia’s legendary underground rail system across the years. In one of the world’s most rapidly growing cities, one thing changes especially fast: the Moscow Metro is expanding nonstop. Shifting political ideologies, a growing population, and construction of strategically important buildings have all altered the appearance of one of the most iconic and ever-present symbols of Russia’s capital: the Moscow Metro. Officially opened in May 1935, this station was one of the very first. On opening day, the station’s floor was made of parquetry, and there was no need for a passage to other stations because they didn’t yet exist. However, a passage to two neighboring stations was built in 1965, and as one of the metro’s longest passages, it joined Biblioteka imeni Lenina, Alexandrovsky Sad and Arbatskaya into a single underground transportation hub that’s still widely used by commuters. The station’s floor has also changed, with more expensive and ornate granite replacing the parquetry. When it opened Okhotniy Ryad was the world’s deepest metro station. Just like Biblioteka imeni Lenina, this station was among the first in Russia. Leading to downtown areas such as the Okhotniy Ryad mall, the Kremlin and Red Square, it was once lit by a number of pylon lamps that stood in a straight row in the center. The pylons were ultimately removed, and the station is now illuminated by ball-shaped ceiling lamps. Planned as an underground vestibule for the never-built Palace of Soviets, the Kropotkinskaya station now leads to the Cathedral of Christ the Savior. The station arguably has one of the most architecturally sophisticated vestibules, built in the form of an arch supported with symmetrical columns. A noticeable change happened to the station after the Moscow Metro officially accepted and registered its trademark in the form of a large red letter M, designed by Art. Lebedev Studio. The huge METRO sign was removed and substituted with the uniform M, the Moscow Metro’s widely recognized symbol. This station’s architect was Nikolai Kolli who worked with the famous French modernist master, Le Corbusier. Opened in 1935, the vestibule is unique because most stations with vestibules in cubic form have been reconstructed and lost their original look. During World War II, the surface entrance was boarded up because the station served as headquarters of the military’s Joint Staff. This station has preserved the old METRO sign on top of the vestibule, a rare site for contemporary Moscow. The Sokolniki stations launched the first underground train when passengers departed here in May 1935. Located on the alley leading to Sokolniki Park, the vestibule is designed as an arch with two separate exits, and the arch’s edge has an engraved quotation attributed to Stalin: “There are no fortresses that the Bolsheviks can’t storm.” The words were crowned with Stalin’s portrait on the arch’s top, but this highly controversial leader’s portrait is no longer there. A mysterious lamp in the form of a star (or, as some say, an upright five-pointed symbol of satanic symbolism) has also been removed. This station on the Filyovskaya Line - (do not confuse it with the Kiyevskaya station on the Blue Line) - was subjected to serious renovations just 10 years after it opened. The Armenian onyx used for the covering of the columns began to break off, and it was decided instead to use a light-blue and light-yellow marble. The old floors, currently made of gray and pink granite, were also replaced. Named after nearby Kursky Rail Terminal, the Kurskaya metro station is decorated with gray marble, and the floor pattern changed form when its rhombus-like marble plates were substituted with square-shaped bars. World War II seriously affected this iconic station on the Blue Line. Not only the famous bronze statues were evacuated to Central Asia, but interior elements of the newly opened passage leading to Teatralnaya station (opened in 1946) were inspired by the Victory. Bas-reliefs on the passage’s walls depict flags and weapons, and the entrance is marked with a slightly modified wartime slogan, “Ours is a righteous cause. The enemy shall be defeated. Victory will be ours.” Stalin’s name, however, has been removed from the wall. Architects designed this station, which received the Stalin Prize in 1951, so that it reflected and extolled the rise of Belorusia’s economy and culture. An allegorical sculpture was erected called “Soviet Belorusia,” but when a new passageway was built in 1997 it was taken away. If you look at old photos you’ll see a number of urns standing close to each pylon in the station. They’re not there anymore. The station’s floor has also changed, loosing the traditional Belorusian pattern and gaining a more classical one of black and gray granite. The architecture of Mayakovskaya station is unique, and its was awarded the Grand Prix at the 1939 World’s Fair in New York City. Initially, the station had only one exit, leading to the Tchaikovsky Concert Hall, but in the 1950s a new vestibule leading to Tverskaya Street was built. This station’s design praises the heroic labor of the Soviet people during World War II. The southern lobby initially formed a separate structure, but was subsequently built into a residential building on Avtozavodskaya Street. If you enter this station from the Paveletsky Rail Terminal you might notice a dark circle on the wall above the escalator. This is where one of many bas-reliefs depicting Stalin once stood, until the process of de-Stalinization began in the Soviet Union in the late 1950s. You may enjoy the beauty of Russian Metro even if you are abroad: check out this 10 metro stations which were inspired by Russia.